Mrs Hughes: "We're celebrating that I can still get a proposal at my age." Mr Carson: "And that's it?" Mrs Hughes: "Of course I'll marry you, you old booby. I thought you'd never ask." Elsie Hughes (b.1862) is the head housekeeper and she is in charge of all the female servants. More or less, she runs the entire servant branch of Downton Abbey alongside Mr. Charles Carson. She is very stoic, but is also ethical and never two-sided. She is originally from Argyll and her father was a farmer. She has just one sibling, a sister Becky, who lives in Lytham St Annes. It is revealed in the fifth series that Becky is "not right in the head." She requires a caretaker, thus Mrs. Hughes has spent most of her earnings providing for Becky's care, leaving her with no savings. Mrs Hughes arrived at Downton as Head Housemaid, when the young ladies were in their teenage years, and was promoted to Housekeeper soon after. Mrs Hughes has revealed that she has never actually been married, but adopted the "Mrs" title as befits a housekeeper. Before working at Downton Abbey, Mrs Hughes was "walking out" with a country farmer named Joe Burns. When she received the offer to work at Downton, he proposed, but, after finding her work as the housekeeper at Downton enjoyable and rewarding, Mrs Hughes refused him. By April 1912, Mrs Hughes is head housekeeper, a prestigious position that is more or less equal with Carson's office as butler. She is a strict taskmaster, but kind-hearted, offering advice and words of comfort to staff members in distress. When Mr Bates badly mangles his leg in an attempt to correct his limp, she helps him and reminds him that no one thinks the worse of him for his handicap. Furthermore, she looks out especially for William, who is often melancholy due to homesickness and Thomas's bullying. Joe Burns arrives in town with the intent of a second proposal. Mrs. Hughes goes with him to dinner and the fair, but after realizing that she is no longer the same farm girl of past years (and that Downton would most likely fall to pieces without her) she again refuses and continues in her post. In the last episode she is the first person at Downton to become aware of the chauffeur Tom Branson´s interest in Lady Sybil as she observes Lady Sybil and Branson holding hands for a short moment in celebration of the housemaid Gwen having finally succeeded in getting a job as a secretary. She warns Tom that he may lose his job and end up with a broken heart if he is not careful. The beginning of the war sees Mrs Hughes busier than ever in overseeing Downton's management, dealing with various domestic crises including Carson's illness from overwork (and later from Spanish flu) and Branson's "assassination" attempt on a visiting general. A shocked Mrs. Hughes finds new maid Ethel and houseguest/patient Major Bryant in bed in the servant's quarters. Livid, she dismisses Ethel, who later reappears with the announcement that she is pregnant. From then on, though clear she disapproves of Ethel's choices, Mrs Hughes smuggles food to the poverty-stricken Ethel and her infant son, attempting several times to give an irresponsible Major Bryant Ethel's letters. Cora discovers the situation just before Bryant is killed in battle, and later arranges for the Major's parents to come to Downton. Mrs Hughes tries to sneak Ethel into the house to meet with the Major's parents, but the attempt goes disastrously wrong. Not willing to give up, however, she arranges a second meeting and speaks up for Ethel in the face of Bryant's father's bullying. Though unwilling to register an official opinion upon hearing Ethel's decision not to give up her son Charlie, she is much kinder towards Ethel, perhaps even with some small degree of admiration. With Bates's trial looming, Mrs Hughes attempts to comfort a distraught Anna with the fervent belief that Bates, being innocent, will be freed. 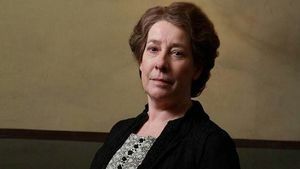 However, she is called unwillingly to speak for the prosecution, and tricked into revealing the damning conversation she overheard between Bates and Vera - including that he had sworn at and threatened to strike his wife. Obviously shaken, she nevertheless continues to comfort the grieving Anna after Bates is convicted. Mrs Hughes continues to help Ethel and Charlie, who have fallen on hard times. At Mrs Patmore's insistence, Mrs Hughes consults Dr Clarkson about a suspicious lump that she fears is cancerous; though visibly distraught at the thought of her illness she refuses to confide in any of the staff except Mrs Patmore, even at the cost of being upbraided by Carson for apparent laziness. By the end of the episode she is awaiting results that will tell her whether or not she has breast cancer. While still awaiting results, she discovers that Carson has figured out the cause of her stress and is initially irritated when he attempts to treat her like an invalid; however, she is touched when Cora tells her that no matter what happens she will always have a home and the help she needs at Downton, giving her new found respect for the family. A visit to Dr Clarkson confirms that the suspicious lump is not cancer, but only a benign growth. Carson, relieved, responds to the news by singing as he goes about his work, making her smile. Mrs Hughes has a close relationship with the butler Mr Carson. They often share wine in her sitting room or his pantry. Their relationship is friendly but there are hints of some sort of romantic feeling between the two. For example, when Mrs Hughes got the all clear on the possibility of her having cancer she saw Mr Carson singing because he was so relieved. Not only that but he was singing "dashing away with a smoothing iron she stole my heart away". It made her smile. When former chauffeur Tom Branson returns to Downton Abbey as Lady Sybil´s husband she is one of the few servants who accept the new situation. She is friendly and welcoming when he comes downstairs to say hello to his former co-workers. Thomas Barrow later tells her about his homosexuality. She reveals to Carson that Thomas is not the first person she has known "of that sort." She insists that Jimmy must have led Thomas on, calling Jimmy a "vain and silly flirt" and insists that Thomas not be ruined. Mrs Hughes, like Mr. Carson, does her best to keep up the work pace while the family is in Scotland, but does ask him to let them have some fun. Mrs Patmore talks to Mrs. Hughes about Jos Tufton, but she advises caution, and is not pleased to see him trying to impress other women at the Thirsk fair, then sees him kissing other women as well as stroking one's bottom. She later reveals to Mrs Patmore what she saw, but is surprised Mrs. Patmore is glad to be away. They both start laughing. When Tom Branson is made to feel awkward and ashamed by new maid Edna Braithwaite, Mrs Hughes comforts him and assures him that he should not be ashamed of being part of the family and that he has done well, and that Lady Sybil would be very proud of him and comforts him as he breaks down in grief for his wife. She then swiftly fires Edna, whom she was suspicious of for a while. Mrs Hughes, like Mr Carson and Tom Branson, is unhappy about the fact that Edna Braithwaite has returned, and is certain that they cannot have her back. But Carson determines they cannot speak out and resolves they should keep an eye on her. Mrs Hughes nonetheless feels that Edna's return is "a ticking bomb." Her fears are proven right after Edna intoxicates Tom then tries to blackmail him into marrying her with lies that she might be pregnant. Desperate, Tom confides in her (on Mary's advice to find someone he can talk to after she sees him feeling guilty and ashamed and he does not tell her). When she asks him if he expects her to help him, he states he did not know who else to turn to. She and Tom then confront Edna, where she reveals evidence behind Edna's scheme and threatens to ruin her if she does not leave and keep quiet. But after Edna leaves the room, she admits to Tom she wasn't certain Edna was not pregnant, but now is. She asserts to Carson following Edna's departure from Downton they were "mad as hatters" to let her back in the house. When she finds Carson's old colleague Charles Grigg has fallen on hard times, she steps in and helps him when Carson would not, and encourages him to let his old wounds heal. Eventually they do, and she even takes a picture of Carson's old love Alice Neal and frames it for him. He thanks her, clearly very touched, after they talk about it later. She is the first one to know Anna was raped by Lord Gillingham's valet Green (until Anna tells Mary), having found her afterwards. Anna swears her to secrecy, but Mrs Hughes tries to get her to mend her relationship with John (which has soured because she is avoiding him), and will not hear of Anna thinking of suicide (which she plans on doing if she turns out to be carrying Green's child). Unfortunately John, who by now has been convinced he is at fault for Anna's behaviour and that she no longer loves him, overhears the two women talking and tells Mrs Hughes he will leave unless he learns the truth. She stops him and assures him Anna still loves him, and decides to tell him so he would stay, feeling John's departure would finish Anna. But she swears Green is not to blame despite John's suspicions. Later he tells her nothing is settled after Anna was confident John believed her. Mr Carson refers to her as quite a plotter when she wants to be. She replies it is a skill all women must learn. When Lord Grantham has to go to America to help his in-laws, she knows he will take John with him and insists to Mary that Thomas should go instead, because John needs to be with Anna. When Mary asks why, Mrs Hughes has to reveal the truth of what happened to Anna, but once again remains silent as to who was responsible. She confronts Green in the boot room after he returns with Lord Gillingham. Green tells her he and Anna were both drunk, therefore they are both to blame. But Mrs Hughes steadfastly reminds him he alone is to blame, and warns him to watch himself. She also discovers a ticket in John Bates's coat indicating he went to London from York, and did not remain in York like he claimed. She reveals the ticket to Lady Mary, insisting that they can never know what happened that day in London. She supposes Bates might not have been near Piccadilly and instead might have been in London for a different reason. But if Bates was there to avenge his wife's honour, Mrs Hughes insists she will not hold it against him. When Mary insists they cannot keep the secret no matter what they feel, Mrs Hughes insists that they cannot ruin Bates because Green, in her words a vicious, vile monster, is gone from the world. Mary only destroys the ticket after Bates retrieves a stolen letter that would cause a royal scandal. Mrs Hughes respects, and to a degree, protects Carson. She has taken more care of him with each passing series, on a domesticated and emotional level. They behave very much like a squabbling old married couple, and care very deeply for each other. This extends to their relationship to the staff as well, where Carson is a strict father figure, and Mrs Hughes, the more approachable and understanding mother figure. It is suspected that she started developing romantic feelings towards him after her cancer scare, after she had heard him singing happily for her good health while polishing the silver. In Series 5, when he suggests that they invest in a property together, it is implied that she believes he is considering their retiring together and getting married someday, and her face breaks out into a wide smile. In the Season 5 finale, which concludes the episode at Christmas in 1924, Carson reveals that he purchased a property in both of their names in hopes that they would marry and retire there. He proposes to her and she happily accepts. While Mr Carson loves Lady Mary like his surrogate daughter, Mrs Hughes is extremely attached to Anna May Smith, whom she has likely known since she was a young girl. She is extremely protective of Anna, and as an extension, her relationship with Mr Bates. She also feels somewhat responsible and guilty for Mr Bates' arrest in Season 2. However, Mrs Hughes is not a naturally affectionate person, and her moments of tenderness are almost completely limited to when Anna is hurting. This might also be because their relationship is not shown as two sided, as while Mrs Hughes loves Anna deeply, Anna only comes to her when she is in need. Phyllis Logan is married in real life to Kevin McNally, the actor who plays Horace Bryant. She is main character throughout the series. In "The Chronicles of Downton Abbey : A New Era" by Jessica Fellowes and Matthew Sturgis, Jullian Fellowes relates that Elsie Hughes, "represents what must surely have been the majority of servants who regarded service as just a job; servants who neither worshiped or hated their employers, and would meet the different future without either passion or regret."